Over the course of a year we filmed emissions and conducted air sampling at the three project facilities in order to identify patterns in emissions and toxic pollutants to which nearby residents may have been exposed. In addition, we conducted in-depth research on the operations and permitting history of the facilities, which shed light on how emissions are tracked and regulated under the US Clean Air Act and by the Pennsylvania Department of Environmental Protection. 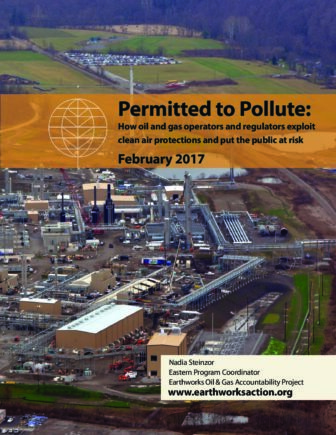 Based on this comprehensive research and findings, Earthworks has developed recommendations that, if adopted, would help oil and gas regulators better fulfill their responsibility to safeguard air quality and communities.